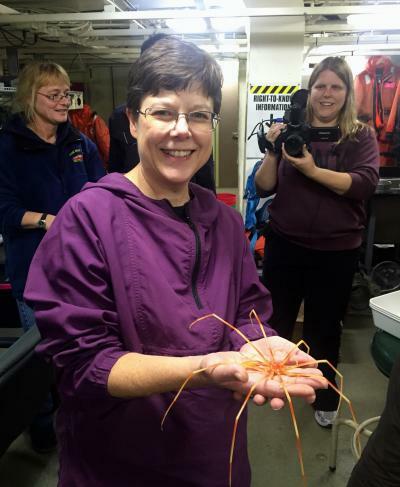 PolarTREC teacher Sandra Thornton holds a sea spider collected from the bottom of the Chukchi Sea. Photo by Kate Segara, Courtesy of Sandra Thornton (PolarTREC 2016). Share your knowledge and passion for science! Researchers can host a PolarTREC teacher in the field and share their knowledge of polar research in both formal classrooms and informal educational settings around the world. By including a PolarTREC teacher, the research team gains a trained and enthusiastic helping hand in the field, an expert in communication and outreach to share their science, and connections between the science and the education communities. Researchers working in the polar regions can apply to host a PolarTREC teacher on their scientific expeditions in the Arctic or in Antarctica. Researchers do not incur any additional costs to their project, but can gain a lot from the inclusion of a teacher on their project. Researchers interested in learning more about hosting a teacher, can do so at About PolarTREC, Program Goals and Objectives, Researcher Frequently Asked Questions, and Program Requirements. The application for researchers to host PolarTREC teachers is generally available late summer for the upcoming arctic and Antarctic field seasons. If you are interested in hosting a PolarTREC teacher, please contact PolarTREC Project Managers at info [at] polartrec.com to discuss your individual situation. 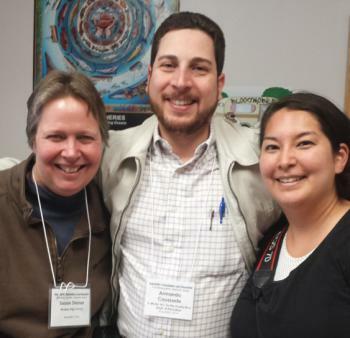 PolarTREC teachers Susan Steiner, Armando Caussade and Dominique Richardson at the PolarTREC orientation meeting in Fairbanks, Alaska. Photo by Janet Warburton. You do not have to host a teacher on your expedition to serve as a content expert or mentor to pre- and in-service teachers interested in improving their knowledge of polar science. Through the alumni and extended networks, researchers serve as valuable contributors as presenters or just someone willing to be contacted to answer questions or review science material for a lesson plan. If you are interested in serving as a content expert, please email info [at] polartrec.com. Please include your name, contact information, and a brief description of your scientific interests. 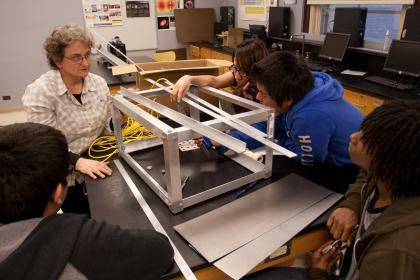 Paula Dell and her students work on their remotely operated underwater vehicle, Fish Spy. Photo by Andy Fitz, Courtesy of Paula Dell (PolarTREC 2013). PolarTREC is a continually growing network of teachers, scientists, and other polar professionals. If you are interested in making connections to teachers in or near your community, let us know! Additionally, don't forget to visit the online PolarTREC Learning Resources Database before your next classroom visit or community outreach event. The Learning Resources database includes interdisciplinary lesson plans, activities, video, audio and more tools for your next outreach event.